Data collected by Netscope reveals that the Portuguese still prefer the Internet Explorer browser, but Google Chrome begins to gain a market share. 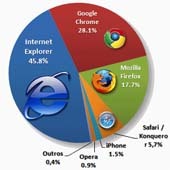 According to data collected by Netscope for the year 2012, the browser most used by the Portuguese to surf the Internet continues to be Internet Explorer. This was, during the year 2012, the browser that generated more views on web pages, and in January reached its peak of 51.1%. Even maintaining the highest market share, it still fell by 22.1% between January and December 2012, having finished the year with less 11 percentage points than their original share. In the second place, according to the Netscope data, is still Google Chrome. It recorded a market share of 28.1% and consecutive monthly gains with a rise of 43 percentage points between the first and last month of the year. The proximity between Chrome and Explorer are increasingly evident, in December they even managed to be separated by only 7.4%, but the trend got diluted throughout the year. Mozilla Firefox is in third position, with a share of 17.7% annual average, but continued to register falls, with a decrease of 8 percentage points between January and December 2012. In the last place remains Safari, the original Apple browser, which failed to achieve in Portugal an average bigger than 5.7% market share. Although IPhone users represent 1.5% of online browsers.